It’s been half a decade since Apple launched their iPhone campaign titled “There’s an app for that“. In the years following, the mobile app stores (from all the major players) have continued to blossom to the point that not only are there several thousand apps that help light your way (i.e. by keeping the flash running bright), but every company, cause, group, or notable event is expected to publish their own mobile application. Today there are several hundred good “rapid development” kits that allow any newbie to craft and release their own mobile application and several thousand small professional software development teams that will create one on your behalf. These bespoke mobile applications aren’t the types products that their owners are expecting to make much (if any) money off of. Instead, these apps are generally helpful tools that appeal to a particular target audience. Now, while the cynical side of me would like to point out that some people should never be trusted with tools as lofty as HTML and setting up WordPress sites–let alone building a mobile app, many corporate marketing teams I’ve dealt with have not only drunk the “There’s an app for that” Kool-Aid, they appear to bath in the stuff each night. As such, a turnkey approach to app production is destined to involve many sacrifices and, at the top of the sacrificial pillar, data security and integrity continue to reign supreme. A few weeks ago I noticed that, in the run up to the RSA USA 2014 conference, a new mobile application was conceived and thrust upon the Apple and Google app stores and electronically marketed to the world at large. Maybe it was a reaction to being spammed with a never-ending tirade of “come see us at RSA” emails, or it was topical off the back of a recent blog on the state of mobile banking application security, or maybe both. I asked some of the IOActive consulting team who had a little bench-time between jobs to have a poke at freshly minted “RSA Conference 2014” mobile application. With the RSA Conference Mobile App, you can stay connected with all Conference activities, view the event catalog, manage session schedules and engage with colleagues and peers while onsite using our social and professional networking tools. You’ll have access to dynamic agenda updates, venue maps, exhibitor listing and more! Now, I wasn’t expecting the application to be particularly interesting–it’s not as if it was a transactional banking application etc.–but I would have thought that RSA (or whoever they tasked with commissioning the application) would have at least applied some basic elbow grease so as to not potentially embarrass themselves. Alas, that was not to be the case. The team came back rather quickly with a half-dozen security issues. Technically the highest impact vulnerability had to do with the app being vulnerable to man-in-the-middle attacks, where an attacker could inject additional code into the login sequence and phish credentials. If we were dealing with a banking application, then heads would have been rolling in an engineering department, but this particular app has only been downloaded a few thousand times, and I seriously doubt that some evil hacker is going to take the time out of their day to target this one application (out of tens-of-millions) to try phish credentials to a conference. It was the second most severe vulnerability that caught my eye though. 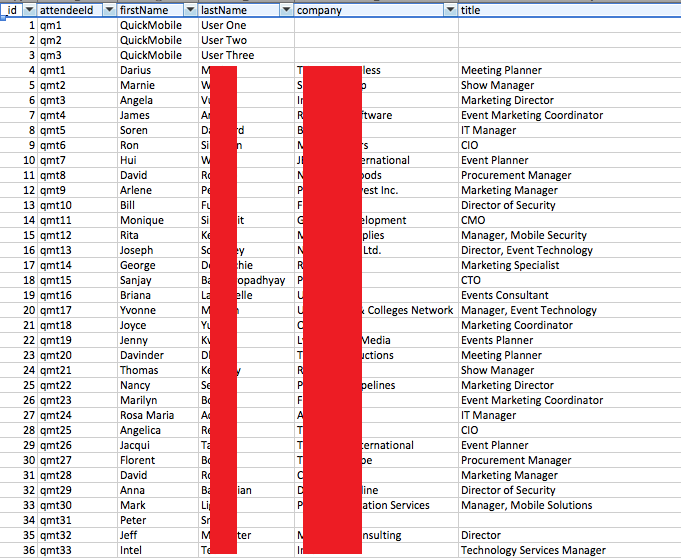 The RSA Conference 2014 application downloads a SQLite DB file that is used to populate the visual portions of the app (such as schedules and speaker information) but, for some bizarre reason, it also contains information of every registered user of the application–including their name, surname, title, employer, and nationality. I have no idea why the app developers chose to do that, but I’m pretty sure that the folks who downloaded and installed the application are unlikely to have thought that their details were being made public and published in this way. Marketers love this kind of information though! Some readers may think I’m targeting RSA, and in a small way I guess I am. Security flaws in mobile applications (particularly these rapidly developed and targeted apps) are endemic, and I think the RSA example helps prove the point that there are often inherent risks in even the most benign applications. I’m betting that RSA didn’t even create the application themselves. 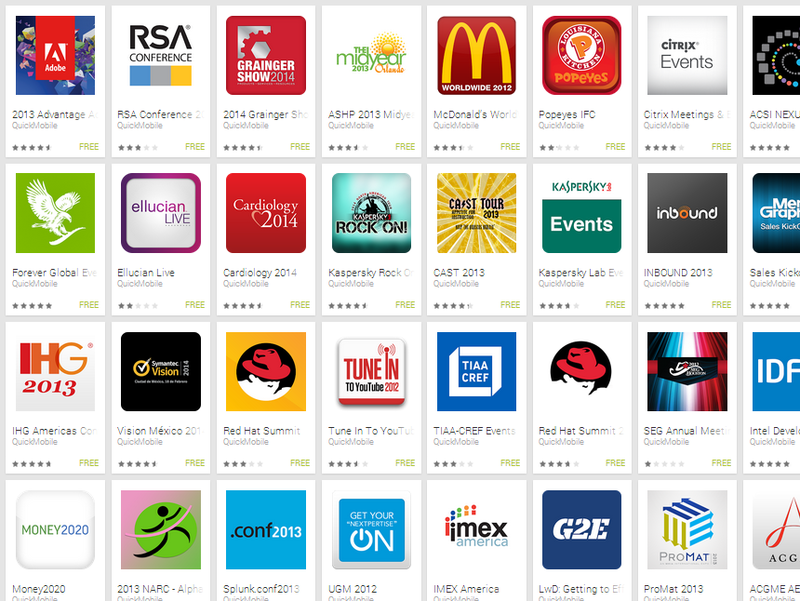 The Google Play store indicates that a company called QuickMobile was the developer. With one small click it’s possible to get a list of all the other applications QuickMobile have created for what I would assume to be on their clients behalf. As you can see from above, there are lots of popular brands and industry conferences employing their app creation services. I wonder if many of them share the same vulnerabilities as the RSA Conference 2014 application? Here’s a little bit of advice to any corporate marketing team. If you’re going to release your own mobile application, the security and integrity of that application are your responsibility. While you can’t outsource that, you can get another organization to assess the application on your behalf. 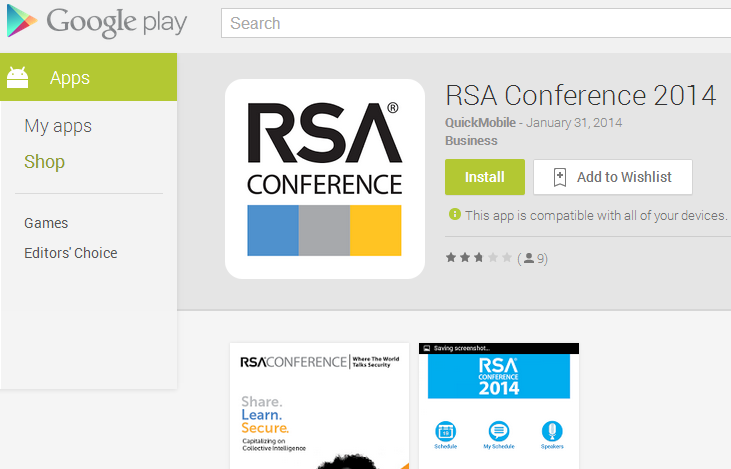 In the meantime, readers of this blog may want to refrain from downloading the RSA Conference 2014 (and related) mobile applications–unless you’re a hacker or marketing team that wants to acquire a free list of conference attendees names, positions, and employers.